HABIT: Tufts of narrow stems topped by narrow plumes of fluffy purple flowers. Several good varieties exist. Native to Texas and Oklahoma. CULTURE: Tough, drought tolerant wildflowers that respond fairly well to maintained gardens. Cut to the ground in winter. Can be planted from pots or seed. 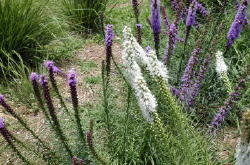 USES: Perennial gardens, borders, summer flowers. Makes wonderful cut flower because the purple color lasts indefinitely in a dry arrangement.